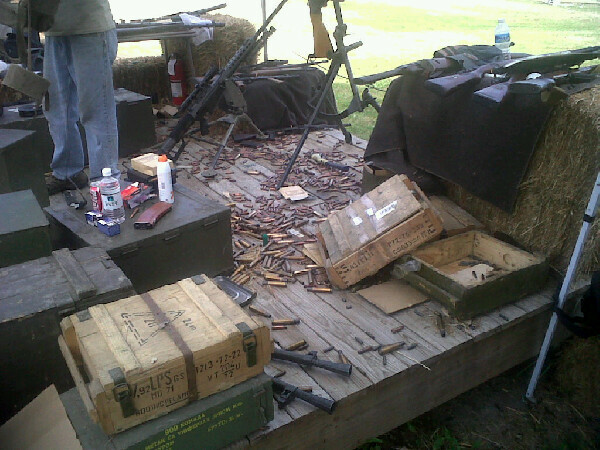 The deck under the Browning .30 cal machine gun at the Blogger Shoot. Who’s gonna pick up all that brass? As I related recently, I am anticipating a bonus at work the end of the year, so I am looking at getting my first AR-15. While working over that decision, I came to the conclusion that an AR-15, even if it were given to me, would still cost me a lot of money to run. The reason is simple economics* – supply and demand. The supply of 5.56mm NATO ammunition is limited, and the demand is almost all going over to the Middle East or to military training, leaving a scant amount for civilian sales. This lead me (back) to the idea of reloading. The arguments for reloading are many, and they have different weights depending on your end use. For hunters, you can tailor a load to your specific need, or even load a caliber that isn’t even made any more. For me, the draws are obviously cost, availability, and customized competition loads. Their are 2 parts of the reloading cost equation – total cost, and rounds loaded. This yields a cost per round fired, and when you multiply that by 50 or 20, you can compare that to commercial ammo. Like any manufacturing process, there are fixed costs and variable costs. The fixed cost is mostly the reloading press, dies, case cleaning equipment, reloading stand, and the other parts you need to buy. The variable cost is the brass, primer, powder, and bullet that makes up each round. The variable cost is further complicated by economies of scale – that is, just like diapers, beer, and fighter planes, the more you buy, the lower the price per unit. To decide whether a project is feasible economically, you figure the total variable cost per year, and subtract that from the cost to buy the ammo commercially. This is the annual variable cost savings. You then divide that into the fixed cost, to see how many years of shooting it would take you to pay for the reloading equipment. So, I figured what it would cost to buy components for 2,000 rounds per year of 9mm, 500 rounds of .45ACP, and 1,000 rounds of 5.56mm, assuming I could re-use my pistol brass I already had, and I would buy once-fired military 5.56mm brass. Comparing that to the cost of store-bought ammo, I figured I would save about $300 per year, or about one year to pay back $300 worth of reloading equipment. Admittedly this is rather sensitive to whether I can re-use brass, but it is still enough of a payout to justify it to me. For availability, I only have to remember my history. When the current war broke out, the availability of a lot of ammo went to zero, along with components like primers. As long as I stay ahead by laying in components when they’re on sale, I can stay ahead of this as well as anyone, should it happen again. Then there is the issue of customized loads, especially for competition. I can work up a low recoil 9mm load or .45ACP load, which would be easier to shoot, and cheaper as well. And since every AR is different, I can work up cheaper and easier shooting 5.56mm rounds too. So, for me, the decision is made – I will buy a reloading press with the first part of the bonus, and whatever is left will go into the AR fund. Now comes the next stage – what kind of reloading equipment to buy? *Simple economics for capitalists, that is. If you’re a socialist, never mind. Just seize someone else’s ammo.